Supervisor and Metro Board Member Janice Hahn. Visitors to the Port Of Los Angeles can now access numerous popular waterfront destinations by bicycle thanks to a newly launched bike sharing system provided by Metro and the Port of Los Angeles. Officials today unveiled 13 Metro Bike Share stations and 120 bikes at key waterfront locations, including Gateway Plaza and Fanfare Fountains, the Battleship IOWA, the Los Angeles Maritime Museum, the Catalina Sea and Air Terminal, the Downtown Harbor, Wilmington Waterfront Park, Ports O’ Call Village and more. Click above to visit an interactive version of the map. Prospective bike share users at the Port can now buy a monthly or annual pass for Metro Bikes by registering online at www.metro.net/bikeshare. Just 30 minutes from downtown Los Angeles and an hour to Catalina Island, the L.A. Waterfront is an increasingly popular local destination with two million visitors last year. The waterfront is also home to several development projects located in the harbor communities of San Pedro and Wilmington. Numerous outdoor activities and events are scheduled every year, including the next CicLAvia: San Pedro meets Wilmington presented by Metro on Sunday, August 13. Monthly passes are $20 for unlimited 30-minute rides. Annual Flex Passes are $40 a year with each ride $1.75. Occasional users can walk-up to the station kiosk and purchase a single 30-minute ride for $3.50 with a credit card. Discounts on bulk passes are also available for employers through Metro’s Bike Share for Business program. A single pre-registered Metro TAP fare card can be used to ride Metro Bus and Rail lines and the Metro Bike Share system, making the Metro Bike Share system the nation’s most integrated with transit. First-time users can also receive a free monthly pass by using the promo code RIDEPORTOFLA2017. The Port of L.A. launch is part of a second phase for Metro’s Bike Share Program to expand the bike share network beyond downtown Los Angeles. A bike share launch in Venice is planned later this summer. The region’s bike share expansions combined will result in approximately 1,400 bicycles at up to 125 stations. Metro has launched bike sharing in downtown L.A. and Pasadena. To date, more than 200,000 trips have been made on the system, with more than 495,000 miles traveled. More than 6,600 bike share passes have been sold. Metro’s bike share system has also helped prevent more than 471,000 pounds of carbon dioxide emissions – CO2 is a greenhouse gas that contributes to climate change. 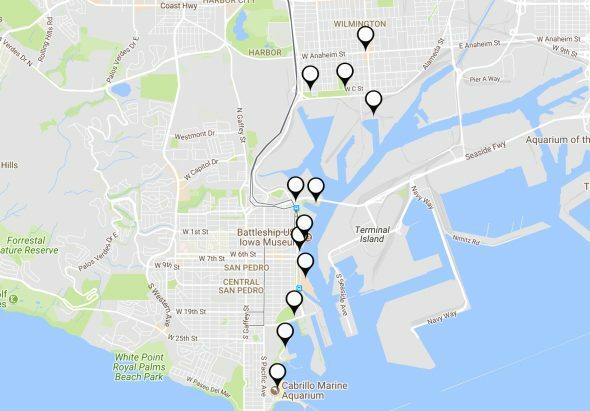 For a map of bike share stations in Port of Los Angeles and other existing and planned locations, please visit https://bikeshare.metro.net/stations/. Im very curious about the success of these bikes. In May, when the rides were comped, I found it super convenient since they were close to the Pico Station at Blue & Expo. I could run two errands in less then 30 minutes, hop back on the train and be done. Im wondering what will entice people in Pedro to ride since there does not seem to be an interface outside of ditching your car or wallking to one of the bike stations. Unrelated but related (pie in the sky), It would be very very very wise in my opinion to have a short spur of the Blue Line go into Pedro/Wilminton, through the ports. Recently had to do business in San Pedro and boy is the place a hidden gem of L.A. (Maybe why transit is the way it is), But if I could somehow get a train to gaffey and (the other) 7th st, Id ride a bike every time i got down there. Id also visit a heck of a lot more. The Silver line is okay, but lacks. Agree. Always enjoy visiting the Pedro but it’s a journey, for sure. The Silver Line is pretty quick way of getting there once the bus escapes DTLA. Blue Line spur comes up from time to time but never been seriously pursued. I am disappointed that there are on stations along Gaffey. While the area down by the water is great, Pacific and Gaffey have quite a few neat places. I have enjoyed many more lunches along those streets than down by the water.